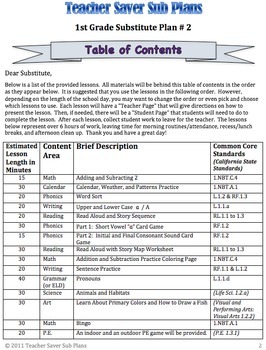 1st Grade Sub Plans (Day 2) - An organized, clear, full day of substitute plans. This is a HIGH QUALITY set of lesson plans for a full day of instruction. You will wish you found Teacher Saver Sub Plans years ago! Lessons cover Common Core Standards. Everything is ready-to-use so you don't have to create anything or write any notes to the sub! Lessons in this set cover math, phonics, writing, reading, grammar, science, art, and physical education. And the best part…you don’t have to make them!!! Some other substitute plans out there require a whole bunch of prep work, or are so confusing you will have to spend hours trying to make it useable. Teacher Saver Sub Plans are very clear and organized. My sub plans provide lessons that are fully laid out for the substitute. Each day of Teacher Saver Sub Plans represents 6 hours of student work. 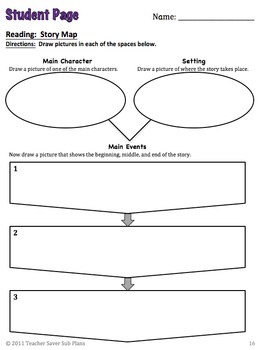 Each lesson comes with a “Teacher Page” that gives a simple and clear lesson plan for the substitute. 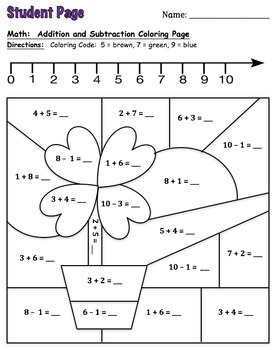 Many lessons also have a “Student Page” which is the worksheet the students use for the lesson. The only thing that you need to do is make copies of all of the “Student Pages.” You have a few options: (1.) Make the copies yourself. (2.) Have the substitute make the copies. (3.) Have a kind teacher, office personnel, or principal at your school make the copies. Any teacher knows that it is almost easier to go to school sick then make sub plans. Not only do semi-decent substitute plans take hours to make, but you have to organize everything, and leave detailed notes. To make matters worse, you are doing all of that while feeling sick. Whatever your reason for needing to take a day off from teaching, Teacher Saver Sub Plans is the solution. So, stop stressing about missing a day of school, purchase your Teacher Saver Sub Plans, and RELAX, because we’ve got you covered! Teachers and substitutes love Teacher Saver Sub Plans! 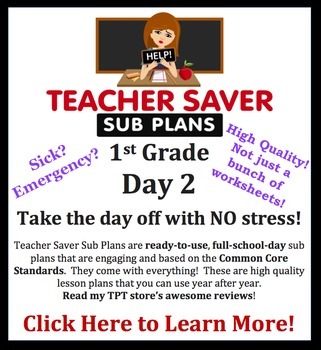 Attention Teachers: I sell Teacher Saver Sub Plans for 1st through 5th grade.